Author of two previous novels, Half a Yellow Sun and Purple Hibiscus, and of a story collection titled, The Thing Around Your Neck, Chimamanda Ngozi Adichie has already received accolades in the form of the Commonwealth Writers’ Prize, the Hurston/Wright Legacy Award and a MacArthur Fellowship. 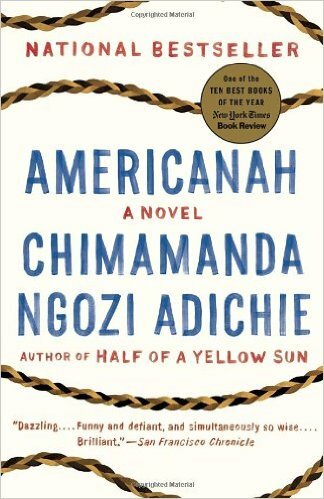 Americanah (2013) won the National Book Critics Circle Award and is well worth the time it takes to traverse its 588 pages. A compelling love story between two Nigerians with complicated personalities and life trajectories, what makes the book a winner for me are the profound insights it provides into contemporary immigration. One lover tries the US, the other England; one opts to return to Nigeria, the other is deported. Adichie deftly describes her characters’ misfortunes and triumphs in a way that does not allow any reader—immigrant, native, black, white, American, British, Nigerian--self-righteous satisfaction. If you don’t mind being on the hot-seat, give this a try. A shout out to one of my smartest students ever, Maya Nathan ’10, who told me I needed to read this. She was right!